Facebook advertisers and Page owners can now share offers on the page with Offer Page Composer, where the visitors can view all the offers from an advertiser at a glance. The Offers can be advertised in Mobile News-Feed and New Feed for site visitors. 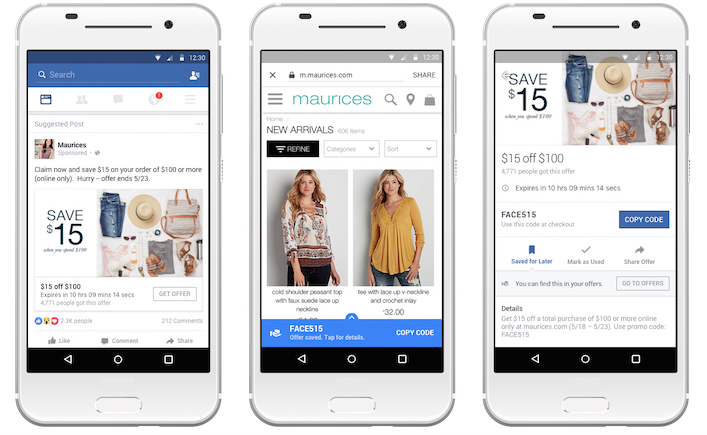 Furthermore, Facebook now offers the flexibility of sharing offers that can be used online or In-Store. According to Facebook Business, the new Offers update, boosted Maurice’s, an apparel Company, campaign ROI by 31 percent for a USD 15 Discount. Launching a campaign with discounts that can be redeemed online with a common coupon code allows retailers to engage the most likely purchasers based on custom audiences and lookalike audiences. 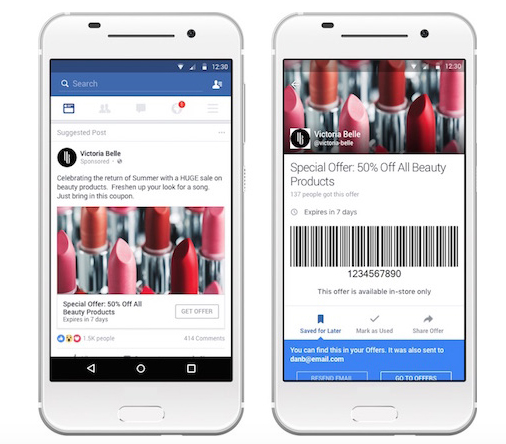 Taking response advertising a step further, Facebook is planning to launch, a customized or a personalized offer allowing retailers to offer deeper discounts at check-out. With customized and personalized offers, retailers and brands can offer discounts for a segment of frequent purchasers, or high value customers. Personalizing the rewards can create a deeper engagement with the most loyal customers. 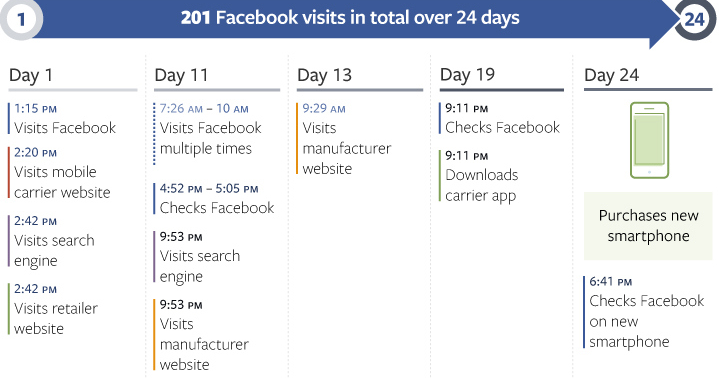 Visitors for a brand site often check Facebook page for a site prior to making a purchase and as per the study shared by Facebook IQ, for an electronic purchase there are a total of 201 visits to a Facebook page in 24 days. With the offers bookmark and offer page composer the target audience looking for product information can easily locate the relevant offers, prior to making a purchase. With the offers Bookmark as well as Offer Page Composer, the users can view all offers for a brand or business. Brands that are looking at retaining their best customers or acquiring new customers of similar profiles can pitch personalized offers based on behavior targeting. Customers that have availed an offer or purchased a high value product from you can be used as custom audiences. In case Brands wish to cross-sell a new product, a personalized offer can be used to target the audience behavior to attract and retain high value customers. Personalized offers in the users News Feed can help Brands retain their high value audience. Brands can also link a discount offer to a certain purchase value. Brands that are interested in targeting an audience segment can use the custom audience pixel to customize an offer to the most likely to convert audience. By offering a Freebie or an additional price-off for a segment of buyers can make your brand stand out. Custom Audience pixel helps you retarget the audience, while conversion tracking pixel helps you analyze advertising performance and optimize bids for ads and audience that are most likely to convert. “After you’ve placed a Facebook conversion pixel on the page associated with your desired conversion action, our delivery model looks at data and then makes adjustments to your bid to serve ads to the people most likely to convert. For people who we predict are more likely to convert, we’ll bid more aggressively than for those who have a low conversion prediction. Advertisers are billed based on the number of impressions delivered to this audience“. Brands that use Dynamic Product ads, for retargeting or attracting new customers Brands can combine an offer to increase the conversion rate. Posted in Social Media. Tagged Ads, Campaign, Digital, Facebook, Retail, Social Media.